Valencia is one of those cities that always seems to be ignored ahead of Spain’s more attention-grabbing cities, such as Madrid, Barcelona and Seville. And we think it’s about time this changed. Just over 800,000 people call Valencia – on Spain’s east coast and at the mouth of the Turia River – home. The city, founded in 138BC by the Romans and now the third largest in the country, is bursting with museums and galleries, while the historic old town shows off its past. It’s mix of sun, culture and cosmopolitan delights is a potent one indeed. And while some consider the 15th century to be its heyday, as one of the components parts of the Crown of Aragon, but modern-day Valencia – as a popular tourist destination and charming city – should not be underestimated. The Valencia passenger terminal is located approximately 6km from the city centre, so passengers will need to seek out public transport, unless they have shuttles organised by their cruise line. The Port of Valencia has two berths with excellent facilities, such as restaurants and gift shops. Access to the terminal from the ship is through an elevated walkway. The port has also recently introduced a pilot test for a bike rental service, consisting of ten electric bikes, as part of the European SUMPORT project. The bikes will be recharged via solar energy. 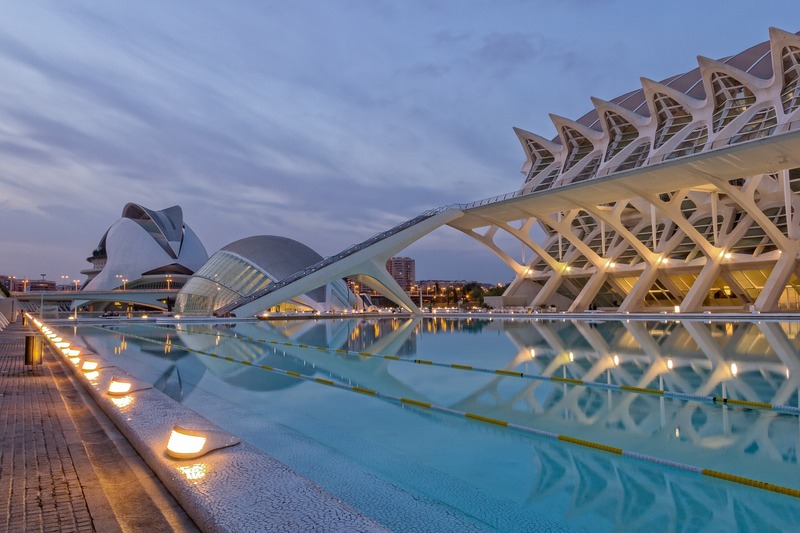 City of Arts and Sciences (CAC): This scientific and cultural leisure complex is regularly touted as one of the ‘must-sees’ of Valencia, and in truth, it’s easy to see why when you consider the breadth of activities on offer. The buildings, designed by Valencian architect, Santiago Calatrava, have quickly become iconic in the city. CAC is home to the Oceanogràfic, Europe’s biggest aquarium with approximately 500 different species; The Hemisfèric, a digital 3D cinema with a 900m concave screen; and The Umbracle, an open-access garden, among other attractions. Old Town: Discover more about Valencian history with a stroll around its gorgeous Old Town. Packed to the brim with things to see, such as the Silk Exchange, a stunning piece of Gothic civil architecture, the Water Tribunal which is a UNESCO World Heritage Site, Catedral De Valencia, a cathedral built on the site of a Roman temple, and the Central Market, a great place for fresh produce. Cabecera Park: In West Valencia is Cabecera Park, one of the most extensive areas of greenery in the city. It also includes the Bioparc Zoo, which has 150 different species of animals and has been designed to recreate the ecosystem of Africa. The Bioparc is divided into four areas: the Savannah, baobab forest, which is home to a dozen elephants, the island of Madagascar and the forests of Equatorial Africa. La Pepica: Ernest Hemmingway used to order a paella from this famous, traditional Spanish restaurant – and that man certainly knew a thing or two about good food and drink. Mainly drink. Horchateria de Santa Catalina: Valencia’s favourite drink, horchata, is a sweet concoction made from water, sugar and tiger nuts. An absolute must if you visit the city. Bodega Casa Montaña: Sure, it’s a little off the beaten track, but this incredible tapas restaurant has been serving small plates of the highest quality since 1836. Can’t say fairer than that. Tapinería Market: This clever, rotating retail space showcases new tastes, shops and stalls every two weeks meaning you never know what you might find. A bargain, hopefully! Barrio del Carmen: A trendy neighbourhood in Valencia’s old town where you’ll find up-and-coming restaurants, bars and, of course, some independent boutiques. Calle Colón: The main shopping street of Valencia and the perfect place to find those high street favourites and a selection of shops unique to Spain. It is a legal requirement to carry a valid form of ID in Spain – your passport or driving license should suffice – and you could face a fine if you walk about without one. If you are planning a trip to any of the Spanish ports then you may also be interested in checking out the latest ocean and river cruise news and our most recent European cruising features.